The active metabolite of vitamin D, 1α, 25 dihydroxyvitamin D3 (calcitriol) is classically known to regulate calcium and phosphate homeostasis and bone mineralization. In addition, calcitriol has also been documented to act as a potent anticancer agent in multiple cell culture and animal models of cancer. However, major side effects, such as hypercalcemia, hinder broad-spectrum therapeutic uses of calcitriol in cancer chemotherapy. Synthesis of calcitriol analogues with the same or increased antiproliferative and pro-differentiating activities, and with reduced undesired effects on calcium and bone metabolism, is getting significant attention towards rational therapeutics to treat cancer. In this regard, phosphonate analogues have been shown to display a certain degree of dissociation between the vitamin D activity in vitro and undesired hypercalcemia in vivo. However, few phosphonates have been described in the literature and fewer of them tested for antitumoral effects. Our group has synthesized a novel vitamin D analogue (EM1) bearing an alkynylphosphonate moiety that combines the low calcemic properties of phosphonates with the decreased metabolic inactivation due to the presence of a triple bond between C-23 and C-24. Biological assays demonstrated that this analogue has potent antiproliferative effects in a wide panel of tumour cell lines, even in those resistant to calcitriol treatment. Importantly, EM1 does not show toxic effects in animals, even administered at high doses and for extended periods of time. 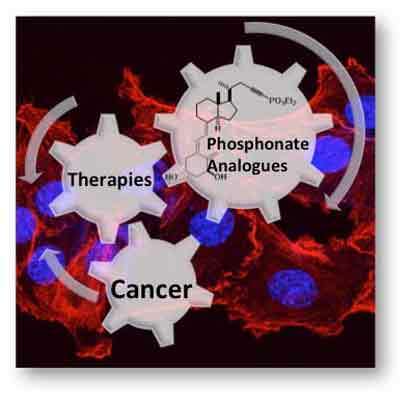 In the current review we discuss the effects and the potential application in cancer of vitamin D and its derivatives, with an emphasis on phosphonate analogues. Analogues, Calcitriol, Cancer, Hypercalcemia, Phosphonate, Therapy. Laboratorio de Biologia del Cancer, Instituto de Investigaciones Bioquimicas Bahia Blanca (INIBIBBCONICET), Centro Cientifico Tecnologico Bahia Blanca, Camino La Carrindanga Km 7 - C.C. 857, 8000 Bahia Blanca, Argentina.